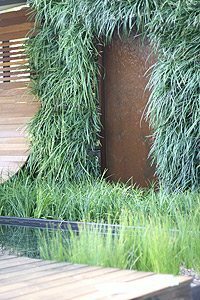 Vertical Gardens in Australia include Vertical Gardening systems that are popular both in a DIY form and as an installed gardening or landscaping system. Garden walls or were first brought to prominance by Patrick Blanc, a Frenchman who used the term ‘Mur Vegetal’. 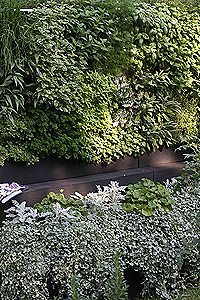 Techniques and materials used in creating Vertical Gardens or ‘green walls’ vary greatly however the desired effect of ‘growing plants on a wall’ is certainly a great addition to modern landscape design. Increasingly popular for use both as a design feature and space saving device, wall gardens or vertical gardens were first used widely used in courtyard situations, in smaller yards and as a way of hiding ugly fences and walls (picture right). Over recent years a lot of different systems for creating ‘living walls’ have been developed, landscape designers and home gardeners alike are finding new modular systems easy to install on walls and fences, when installed the right way hay can also improve the energy efficiency of a building by providing extra insulation. Many original installations of wall gardens involved simple planting systems for succulents, little water was required a quick simple vertical garden or living wall could be installed with little know how. The ‘living wall’ systems that we see evolving today involve a greater emphasis on efficient design of systems that are light weight, larger in scale, have automatic watering or irrigation systems and are low maintenance. Commercial buildings are now adopting vertical gardens both as an environmental feature and an integral part of architectural design. A range of new systems or kits have been designed to allow easy attachment to existing walls, Modular wall garden systems or ‘kits’ that consist of UV resistant PVC plant holders that can virtually ‘stacked’ up a wall with securing brackets even have built in drip system irrigation and allow a much wider variety of plants to be grown. Ferns, herbs, succulents as well as flowering plants can all be grown on systems that will cover a walled courtyard or really any vertical surface. Patrick Blanc is the inventor or the modern Vertical Garden. His ‘mur vegetal’ projects being the best known of modern Vertical gardens or ‘Green Walls’. In Australia vertical gardens have now been developed into a range of forms including self contained lightweight modular systems that are suitable for both home use and commercial applications. The history of vertical gardening dates back to the Hanging Gardens of Babylon, and Ivy covered buildings, but before this the effect of plants growing on cliff faces hints at sources of inspiration for modern designers. Today we have vertical gardens that grow in a range of mediums, from soilless mediums to traditional potting mixes, all have their place and benefits. Plants to consider include herbs and vegetables as well as ferns and grasses, succulents and flowering plants, all be successfully grown using the concept of a vertical garden, today a blank wall can be turned into a vegetable patch, herb garden or a lush green wall, with kits and systems readily available for sale in all Australian states. 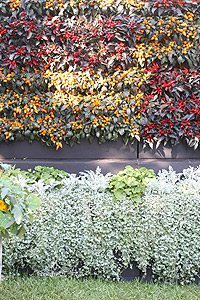 Wall Gardens can be used to grow all sorts of plants on vertical surfaces including vegetables.